Is it possible that being moral can be just as bad as being immoral from a spiritual perspective? Wow, let that question simmer for a moment. Can it be that the “moral majority” at the tea party on the Right is no better than the Left who tolerate all forms of immorality . . . except of course being morally conservative ? Paul wrote to the Galatians, "For in Christ Jesus neither circumcision nor uncircumcision has any value. The only thing that counts is faith expressing itself through love." (Galatians 5:6) To us that may have less impact because we do not wrestle with the issue of circumcision today. If we were to contextualize it and say, "For neither morality nor immorality means anything but faith working itself out in love," we would better understand what Paul was saying. Doing good is not the same as being good. Listen, circumcision is not a bad thing but a good thing in the Bible. But it is also a meaningless thing in and of itself. Love, and only love is the one thing that fulfills everything. In our Christian culture today, sexual sin is at the top of the list of capital offenses. That, however, is not the way the New Testament views spirituality. Acting morally superior to those who are sexually immoral is, in fact, treated more harshly in the New Testament. Why? Here are five reasons: it is deluded, harmful to many more people, far removed from love, is a counterfeit to the true gospel, and is difficult to recognize as sin. We need to treat self-righteousness with more harshness than sexual immorality, if we want to resemble a New Testament spiritual climate. And self-righteousness abounds in churchianity today, almost as much as our judgmental cruelty against sexual brokeness. I have found that self-righteousness is as forgivable as any other sin, it just isn’t as recognizable as other sins. To many it looks “good” and, therefore, is acceptable. Doing good can be the enemy of being good. When someone is convinced that they are good because of all the good work they do, then they are deceived into believing that they do not need help. This is why Paul and Jesus address self-righteous leaders so harshly and those broken and entrapped in sexual immorality with such grace. We tend to do the opposite, don't we. Those who think they are good need a slap in the face to wake them up. A gentle nudge is not enough, so Jesus slapped the Pharisees silly with sarcasm, insults and harsh rebukes. He called them "hypocrites" sixteen times in the Gospels. Why? Because he loved them and wanted them to realize that they also needed grace to find salvation. Paul wrote nice words to the Corinthians and said nothing at all nice to the Galatians for the same reason. The Corinthians were tolerating immorality of such a kind that even the pagans blushed. They were divided and had celebrity preachers that they followed. They turned the communion into a party and got drunk on the wine. But Paul called them "saints" (holy ones) eleven times. The Galatians were striving to do everything right, by the book without compromise and at great cost. They were moral in every way. Paul had no kind words for them. This is the only letter that he did not use the word "saint" when addressing the church. Instead he called them: "cursed," "bewitched," "foolish," canibalistic and "separated from Christ." He went so far as to say that if they thought cutting off a little foreskin on the tip of the organ made them more spiritual than others, then they should go the extra mile and cut the whole thing off and be really spiritual. Yes, he did say that. He was trying to awaken minds that had been deceived. He knew this, because he had been one of those Pharisees that Jesus had to slap around before he would come to the light himself. And that was his love and concern for the Galatians. Being deceived is a tough problem. If you knew you were deceived then you wouldn't be deceived. the problem is you are unaware of your real problem. If you knew your zipper was open, you would zip it up, but you are unaware of the problem even though everyone else may see it. A deluded mind cannot think its way out of the box it is in. The deluded mind is the problem, so it cannot fix the problem. The only way to love such a person is to wake them up with a slap in the face. My home is being surrounded by large warehouse stores full of do-it-yourself (DIY) tools and products. Within six miles of my house are seven such stores! In fact, they all seem to be doing good business even though they are all pretty much the same. Evidence of DIY stores can be seen in every room of my house as well. There are not just television shows dedicated to the DIY revolution there are entire TV channels dedicated to it 24 hours a day. The DYI revolution is not just happening in our culture, it has even invaded our view of spirituality, but there are dire consequences of a DIY spirituality. The way we do ministry is plagued by human engineering. Programs are intended to make people more spiritual. We publish curriculum that are designed to make people more faithful. Models of church are intended to entice attenders. We have systems upon systems to accomplish what only God can do. In fact, most of what we call discipleship in our churches is merely an attempt to form people’s knowledge base and conform their behaviors to align with what we think is spiritual. The final product is really just theological moralists lacking true spiritual power. The results, beyond church attendance and proud pew sitters, are pitiful, to say the least. We put faith in strategies of evangelism that are thought to be more effective than others. Pragmatism rather than the power of the gospel drives the evangelistic process in many churches. If we do the process right, we believe, we will see a higher rate of conversions per evangelistic event. One evangelistic method does not save more souls than another. In fact, an evangelistic method does not save any soul at all. Only the gospel of Jesus saves souls, not our methods. I can't save myself and I sure as heaven can't save you, no matter what method I employ. All of these types of ministry exercises reek of human engineering and quickly lose sight of the miracle of God’s promise and power. We have put more faith in our methods than in Jesus, and that is legalism. That is Galatianism. Really, the only thing that is sacrificed by a false gospel is the true gospel. With that sacrifice, we lose everything that is important and keep a lot of things we think are important but have no real value. We do not lose our churches, our leadership, our finances, our buildings, our branding, our statements of faith, our creeds, our organization, our numerical success; even most of our theology is kept in tact with this false-gospel spirituality. All we really lose is everything most important, namely, Jesus (Gal. 5:2–4). Authentic spiritual life is also lost (Gal. 5:6; 6:15). With that, any real impact on the world is lost and replaced with organizations doing supposedly good things. What we lose is what is most important: faith working through love. Using legalistic methods to modify behavior is a resort to a false spirituality based on a false gospel and it does not result in true fruit. If the true gospel of grace is insufficient, then all other efforts will be meaningless in the end. All that is not done in love is meaningless (1 Cor. 13:1–13). We’ve become so content with a false gospel that we have no clue what the real thing is. When we become so accustomed to the type of goodness that is only possible by humans, we have no imagination for a goodness that is possible only by God. As a result, we often see those without the Spirit of God actually doing better and looking more loving than those who supposedly have the Holy Spirit. This dumbing down of love is evident in our churches to such an extent that none are attracted to us but are actually repelled by us. Can the gospel be enough? I am convinced it is the only thing that is enough. I will live or die on that belief. If we are not willing to bet the farm on the true gospel to change lives, and instead we hedge our bets with a little do-it-yourself spirituality mixed in for the sake of practicality, then we are selling our whole selves to a false gospel. We must choose between the whole gospel or no gospel—there is no in-between. For my part, I do not want anything to do with a Christianity void of love. But most people in the world already know the dirty little secret: our churches are not driven by faith working itself out in love. We can say otherwise, but nobody hears us, because our lack of love shouts so loudly in our posture, priorities, and practices. In much of Christendom we have replaced an authentic spirituality with behavior conformed to a moral standard and accepted that as a Christian life. The worst consequence of all when we choose do-it-yourself spirituality is that we get what we wanted—a Christianity all on our own. Christianity without Christ is an awful thing. The Right and the Left are growing farther apart with each passing week. Liberal politicians and conservatives are in a moral and political “take no prisoners” civil war. Each is strengthening its stance and asserting bold and often baseless accusations at the other side. This war has spilled over into all of life, not just politics, and includes the arts, education, business, journalism, science, technology, social services, military, and faith community. The church is posturing itself farther and farther away from any positive influence in society, because it is deeply rooted in a moralistic crusade and quite comfortable shouting at the world from a distance. We should be on a transformative, redemptive mission of peace and love like Jesus the revolutionary, but instead we take stands, pass laws, protect interests and campaign against issues. We react to issues and take defensive postures and look as hateful as any faction in this growing divide. We are not a movement of love, instead we are a voting block. The civil war is hot, and neither side is at all close to building bridges or bringing peace. We simply must take a different approach if we want to make a difference in this world—and now is the time! But in order to make a difference, we must first be different ourselves. We have had unrealistic expectations of imposing morality without spirituality in a world that desires spirituality without morality. This is insane. We are surprised that the unredeemed act like they are unredeemed, but the real shock is how the redeemed act like they are not. 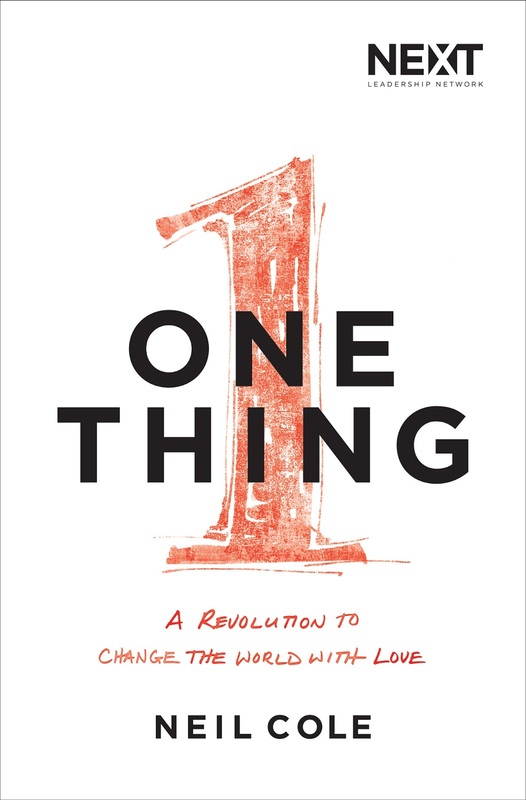 My new book One Thing: A Revolution toChange the World with Love is a call to the church to respond in love toward the world and not to impose our own values on others but rather live them out. Many Christ followers are tired of being the laughingstock of late-night television. They are also angered by the poor results the church is seeing as it seeks to be a transformative presence in society. This book will appeal to Christians who are tired of being characterized by the world as angry people known only for what they are against. It offers an alternative that is biblical, effective, subversive, and loving, all at the same time. It is time for us to trade in our busy religion with so many rules and causes we are staunchly against for a “one thing” spirituality. That one thing is the love that is generated by being with Jesus, being focused upon Jesus, and letting Jesus leak out in our lives. We need to wear Jesus in more ways than just a WWJD bracelet. Today’s world needs a revolution. Not a violent one; we’ve had plenty of those. 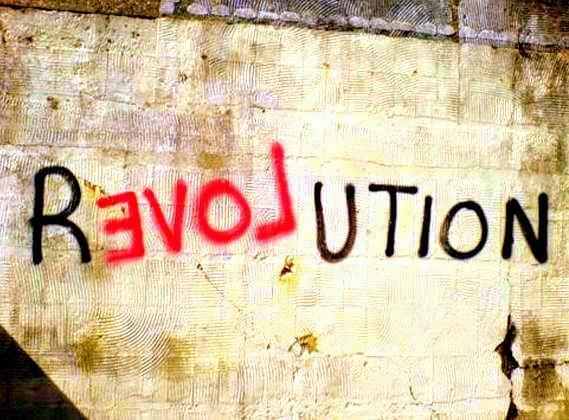 We need a revolution that changes hearts and minds with love. That is what I believe Jesus came for. It is also what I believe he has sent us here for. And it is also what I believe the world is poised to receive. Jesus didn’t come to earth just to change your Sunday morning routine and voting patterns. He came to change your life every day and in every way. The power of change is for every one of us, not just priests, pastors, and preachers. And everyone that is changed becomes a change agent. Today the “evangelicals” are quickly being duped to support a bigoted, bombastic, bully who boasts of sexually conquering other men’s wives and who profits off of other's gambling addictions and objectifying young women. This tells us more about the state of evangelicals than the candidate they support. We are no longer good news to this world. What evangelical is supposed to mean—bringer of good news— is completely different from what it has come to mean for many in our society: judgmental, misogynist, bigoted, homophobic. How did this happen? How did the “good news” people come to be widely regarded as bad news? Evangelical literally means "gospel people" or good news people. The gospel itself is all about transformation—change. We should be the ones bringing a revolution of heart to the world. Instead, we spend our time debating theological stances, moral codes, and political issues. We quickly shout our offense at the world’s values and behaviors. We are people known for resisting change. How did we get here? What will it take for us to rise up again with a real revolution of love that the story of Christ truly merits? Let’s face it: more of the same thinking will only produce more of the same activity. We need a change of mind—yesterday. We need to think and, consequently, respond differently if we hope to make any change in this world for the better. And that is what my new book One Thing: A Revolution to Change the World with Love addresses. This post is from the introduction to One Thing.